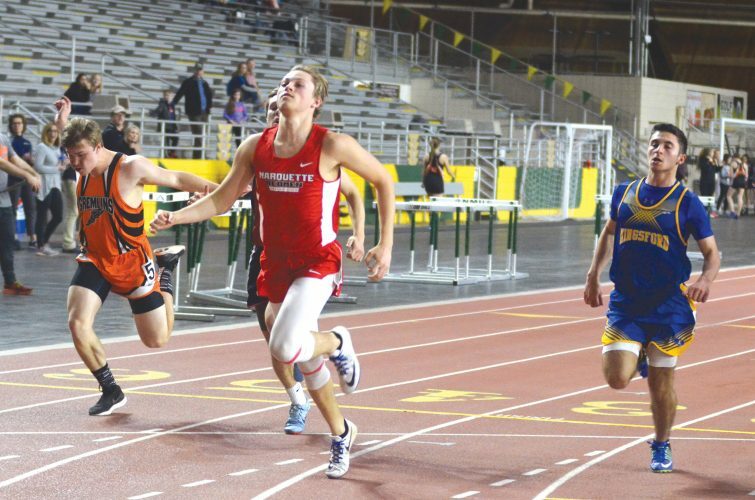 KINGSFORD — West Iron County freshman Holden Ross turned back Escanaba’s Josh Grassel to win the No. 1 singles title Saturday in the Kingsford Invitational. Grassel won the first set 7-6 (6) while Ross took the second 7-5. A 10-7 tiebreaker decided the match. “That was a marathon,” said Kingsford coach John VanDusen. Negaunee, 20, captured the team title over West Iron County 16, Escanaba 13, Kingsford 11, Iron Mountain 5 and Menominee 4. Negaunee’s Jackson Sager-Drew Lindborg defeated West Iron County’s Brandon Henschel-Kevin Ballinger 4-6, 6-3, 12-10 for No. 1 doubles honors. Third-place went to Kingsford’s Preston Strong-Travis Taff. The Fortner brothers, Daunte and Reece, downed Negaunee’s Anderson-Larson 6-3, 6-2 for the No. 2 doubles championship. The runner-up Wykons also had s first from No. 2 singles Neil Tomasoski. “We were blessed with great weather and everything went very smooth,” VanDusen said. SINGLES — No. 1. Holden Ross, WIC, def. Josh Grassel, E, 6-7 (6), 7-5, 10-7. Third — Brett Hicks, K. No. 2: Neil Tomasoski, WIC, def,. Chas Kumpula 6-1, 7-5. Third — Nick McCole, K. No. 3: Tom Sertich, N, def. Bernie Forte, WIC, 6-1, 6-0 Third — Cody Stevens, E. No. 4: Will Lake, N, def. Mitch Ballinger, WIC, 6-3, 6-2. Third — Cade Fernstrum, M.
DOUBLES — No. 1. Jackson Sager-Drew Lindborg, N, def. 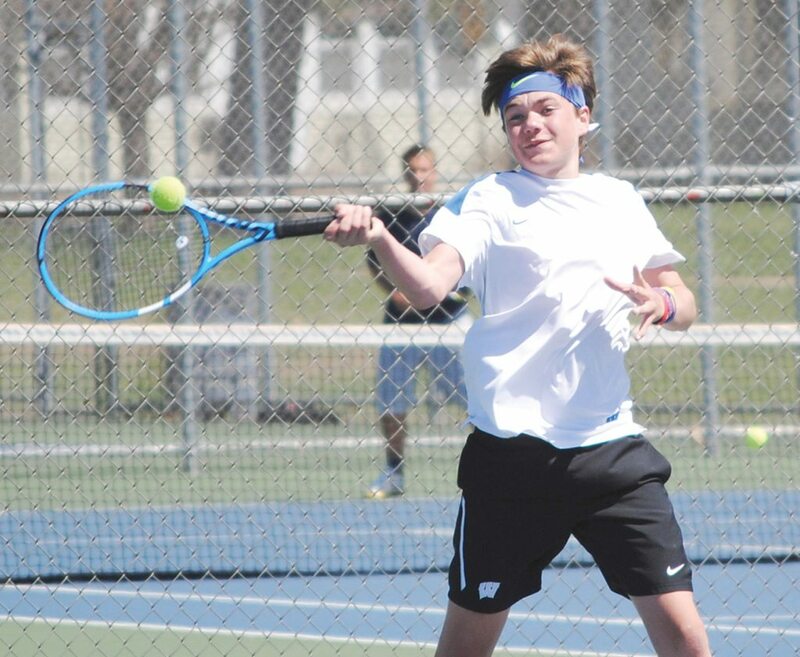 Brandon Henschel-Kevin Ballinger, WIC, 4-6, 6-3, 12-10. Third — Preston Strong-Travis Taff, K. No. 2: Daunte Fortner-Reece Fortner, K, def. Anderson-Larson, N, 6-3, 6-2. Third — Alex Valentine-Soren Thompson, E. No. 3: Ander Sorensen-Mason Hemmila, N, def. Tyler McCarthy-Christian Benson, WIC, 6-0, 6-3. Third — Charlie Wilson-Colton Hayes, E. No. 4: Tom Kivijorski-Erik Salminen, N, def. Austin Giuliani-Dawson Rybicki, WIC, 7-5, 6-3. Third — Garrett LaMarche-Tom Mayville, E.